Today I found out what the “PEZ” in “PEZ Dispenser” stands for. PEZ started out as a peppermint breath mint company in Vienna, Austria in 1927. The name PEZ derives from this fact. Specifically, “PEZ” comes from the German word for peppermint, “pfefferminz”, with the “p” coming from the first letter of the word; the “e” is from the sixth letter, which is the middle of the word; and the “z” from the last letter. The first PEZ mints were not served in modern day style PEZ dispensers, but rather were sold in tin containers, very much like modern day Altoids tins. It wasn’t until 1948 that the first PEZ dispenser was created, called a “Box Regular”, introduced at the Vienna Trade Fair about a year later. This dispenser was in the form of a cigarette lighter, which the company states was to market their bricks as “anti-smoking” mints, which one would think the design would probably have the nice side effect of making it popular with kids, similar to candy cigarettes and other similar product. PEZ became extremely popular in the next decade thanks to beginning marketing the product in the United States and thanks to the new “character” PEZ dispenser designs, such as Santa, Mickey Mouse, and Popeye. Around this time, they also introduced fruity flavored bricks, which significantly boosted sales among children. Another very popular PEZ dispenser in the 1950s was the space gun, which produced a PEZ brick out the barrel of the gun when the trigger was pulled. Over 3 billion PEZ bricks are sold every year in the United States alone. PEZ was founded by Eduard Haas III. This was not Haas’ first successful business venture. As a child, he invented and patented a light baking powder mixture meant to be used in making Gugelhupf cakes, which are a type of marble cake. These “Hasin powder bags” were popularly sold throughout Austria-Hungary. Today, the PEZ dispensers are made in Hungary and China, while the candy itself is made in Austria and Connecticut, with the headquarters of the company in Traun, Austria. The highest price ever paid for a PEZ dispenser to date was for a soft-head Mickey Mouse dispenser, which sold at auction for $7000. This dispenser was a prototype that was never sold publicly. However, one collector did buy a Space Gun PEZ dispenser for $11,000 on eBay, but after chemical analysis, this gun was proved to be a fake. Although, outside of chemical analysis, it was indistinguishable from real Space Gun PEZ dispensers. PEZ had a long standing rule about not creating dispensers in the likeness of real people, but they broke that rule in 2006 when they made dispensers in the likeness of the Teutul family from Orange County Choppers. 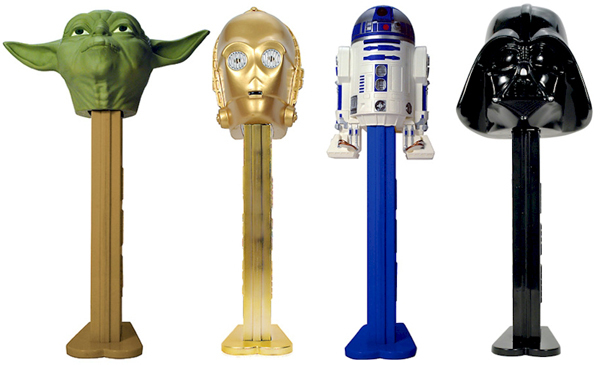 There are around 600 different PEZ dispensers with a few thousand slight variations within those unique designs. The all-time best selling PEZ dispenser line is the Star Wars dispensers. What was on the PEZ dispenser that featured in an episode of Seinfeld? I can’t remember. @Monstrinho: That’s 3 billion bricks. There are multiple bricks per pack. That’s still a heck of a lot of PEZ though, but it’s the manufacturer who are putting out those numbers, so it’s probably accurate.